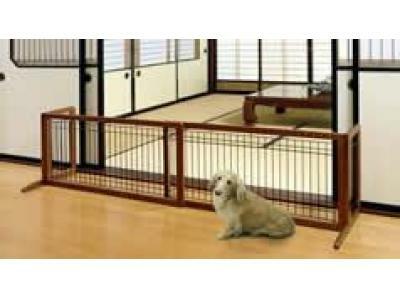 Imagine this beautiful pet gate in your home. It's designed to keep your pet safely confined in most areas throughout your home, while allowing you to move freely about. Its low height allows you to simply step over with ease! Side panels are designed to keep the gate from tipping over, plus the rubber feet keep it from sliding on hard floor surfaces. 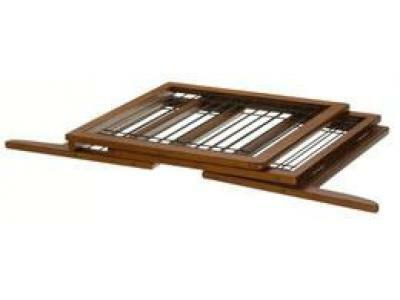 Its beautiful hardwood construction complements Richell's other fine wood pet products! 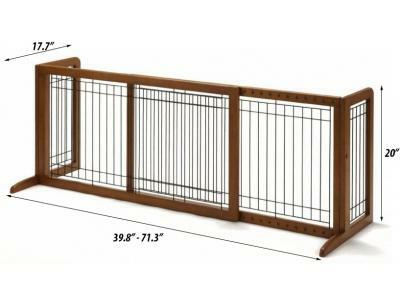 I bought this gate for my home to keep my puppy (3.7lbs) in the kitchen and off the living room carpet. The gate is very nice looking, sturdy and very well made. The finish is gorgeous, it matched my dining table. My only wish is that they make one a little longer. The opening I have in my kitchen/living room is 80" long, so I just didn't put the gate together and let each side stand beside each other at an angle (v shaped) and it is doing the trick. Delivery was quick and with the 10% code I plugged that the site advertised it was a GREAT deal. I would definitely buy from this company again!! Thank you for a great looking yet functional product! Excellent gate and very fast delivery. It is attractive, easy to put together and does the job. Sales-innovations.com is one of the best companies I have ever dealt with. Both three gates earlier this summer and am thrilled with them. I am planning on buying another this month. They are beautiful and do not distract from the formal areas of my home. Delivery was fast and assembly was easy. I would definitely recommend this product. Extremely fast delivery, I purchased a large and small gate. Both gates were assembled in under twenty minutes. They are very attractive, durable and sturdy. They do not detract from my decor and look good against my hardwood floors. The rubber feet also prevent any scratching to my floors. This is a great product and would definitely recommend them to anyone. We can even use them on the deck to keep our puppy from going down the stairs when we are on the deck. Thanks for such a great product. I give this product 5 high fives!!!! 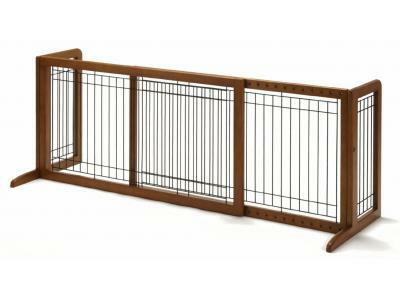 I had been shopping for a gate to keep our maltipoo out of certain areas of our home - she is our first inside dog! 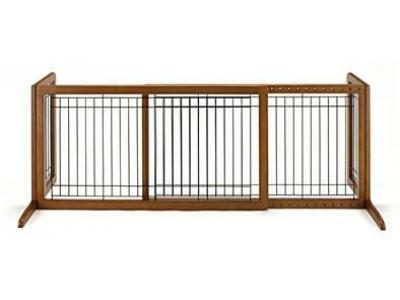 This gate is very nice looking and keeps the dog where she belongs while still allowing all 3 kids to easily step over. I am ordering a second one for another area of our house. It really looks nice with our hardwood floors! This is a great gate. It looks nice in my home. Keeps my 12 lbs pup where she needs to be and not be. She is around 10 so she doesn't even try to jump or climb it. So it is perfect. Also, I have 4 cats and they can all easily jump it which was one of the things I like about it. I am about to order another smaller one just like it. I really like it, but I have a 4 month old 5 pound dog that has learned to jump up and wriggle right over at will - now I wonder what to do since I have $200 invested in these gates??? Dogs don't get much smaller than my little one. I admired this gate in an airline magazine for a couple of years, but was hesitant to pay the price listed. When I found it here for substantially less, I ordered it the same day. It came within just a few days and I LOVE it. I use it to block the mail entry hall, so you see it when you first step in the front door. It looks so nice there and it really is easy to step over. Putting it together was very simple and it is really sturdy and stable. I like it so much, I ordered the smaller one to use in a different doorway. Have ordered lots of these for various applications at both of our homes. They are the absolute best and you can walk over them easily. Plus the pups can see us when they are kept to specific room since the sides allow then a view down the hallway. No more whining because everyone is out of view. We also use them on the deck outside to "corral the puppy or keep from off-limits area (we take them in at the end of the day). They can even fold and store flat under a bed! LOVE THEM!!!!!!!!!!!! We bought two and are getting ready to buy the large one. Just the right size to keep the kids (pets) in and still be able to step over and not break your neck. TOTALLY worth the money!! I bought the large and small (for the two different entrances to our playroom). It's just perfect. Our puppy cannot get to our children's toys and chew on them while the children can climb right over the top of the gate (even our five year old). It's just beautiful in our home as well. Well worth the money. Fast Delivery - great quality - easy to assemble AND IT WORKS! I just may have to get another one!!! Fast Delivery! Love my gate! Thank you. Would recommend to a friend. I bought the large freestanding gate earlier this summer in order to block off a large opening between my kitchen and family room. It's easy to step over and to move out of the way. My puppy has learned to stay behind the gate and doesn't even attempt to go over it even though he could.I think this must be a popular item right now with pet owners. Deal or no deal this is the gate to get.